There is a new mantra for the world of work: “Who you are is going to be far more important than what you do or what you sell”. This is because companies are operating in a fast-changing environment enabled by the technology. What they do and what they sell is going to change at a pace if they are to stay in business. For companies to survive and thrive they need to be nimble and flexible. They need to be able to adapt as disruptive technologies change the way they do business or change the very business that they do. This, in turn, means that organisations are starting to look for a different kind of high performing individual. Today we call these individuals talent. Talent, like organisations, needs to be adaptable and resilient, to be able to cope with change. This means that companies will increasingly look for X-factors beyond a candidate’s qualification. In fact, academic qualifications will have less and less bearing on an individual’s employability in a future-focused workplace. The talent scorecard is changing to suit the needs and complexities of the new world of work. This presentation unpacks how to redefine talent, what to look for beyond the traditional qualifications and CV. Talent Redefined is not just relevant for recruiting companies, human resources and human capital departments who do the recruiting, but for everyone who considers themselves to be talent, of any age, and at every level of an organisation, employed, or self-employed. For companies to remain flexible and nimble in a fast-changing world, they need to be attracting and retaining talented, high performing individuals who are compatible with the Talent Redefined scorecard. Are you? 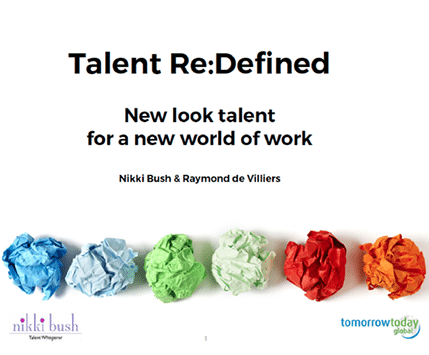 Every delegate will receive a free copy of the Talent Redefined ebook written by Raymond de Villiers and Nikki Bush.